Week 4 Finance Report. 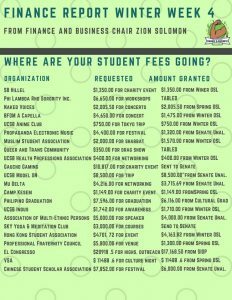 Where are your student fees going? Tomorrow is the last day to vote in the AS Winter Special Election. Voting closes at 4pm. Come grab a cup of coffee and a donut on us!! 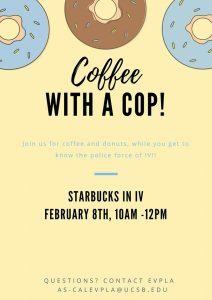 Interact with Santa Barbara County Sheriffs and UCPD! Just coffee and conversations, no obligations! The Associated Students Elections Board would like to thank everybody for participating in this quarter’s Special Election. The voter threshold for this special election was at 8%. The threshold was not met, thereby concluding this election. 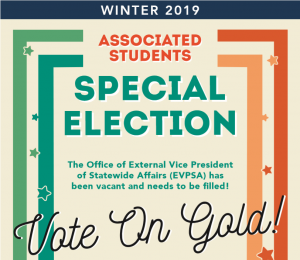 The position of External Vice President of Statewide Affairs will remain vacant until a new candidate has been duly elected during the Spring General Election. If you have any questions, please email elections board. Please keep an eye out on future posts regarding the Spring General Election. Co-funded by AS SCORE! 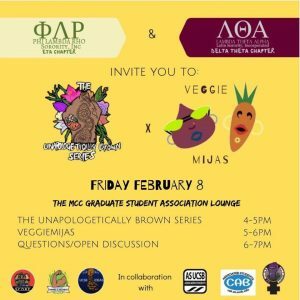 Veggie Mijas & Unapologetically Brown Workshop 2/8 4-7pm MCC Graduate Student Lounge (3rd floor) featuring Johanna Toruño and Amy Quichiz. 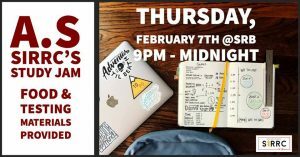 Come find out how to decolonize your food and see some amazing works of art! !